I've been a devoted reader of Ana's blog for ages now. She is the epitome of a Supermom. She'll deny it, but it's true. She has a career, she blogs, takes care of her family including making the most healthy meals from scratch, on top of looking fab every single day. I hope one day I have my act together a fraction of what she does! 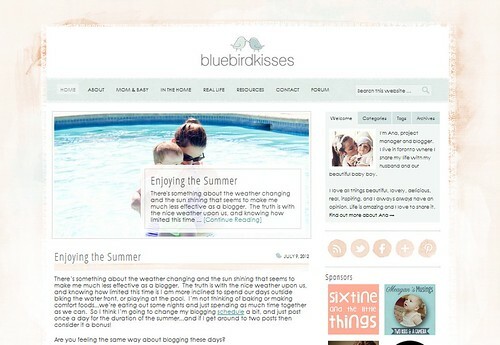 Her blog, Bluebird Kisses, is so pretty. She posts gorgeous pictures, and shares her wisdom (she's a total Mom expert). I HAD to ask her to join in on the 5Q fun. Here's what she had to say. 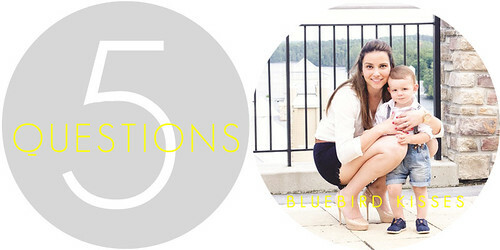 What do you like most about writing Bluebird Kisses? I like getting feedback and feeling like I connect with other moms that are like me, and share the same interests. I was the first out of my close friends to have a baby and that was tough for me. I didn't have anyone to act as a sounding board, or to offer helpful advice. The blog gives me that. I post and without doubt someone out in the bloggosphere has had/has a similar experience. Quite honestly I'm not sure. I love writing my blog, its fun to watch it grow and develop. But I don't have time to make it a business. I own my own company...with one employee...me. But I like that. And I like my day job, so I don't know exactly where the blog fits in. Sometimes opportunities come out of the blue though so I'm leaving it open. As long as I'm enjoying the blog, I will continue to post. On weekends when Johannes naps for 2-3 hours, I have imposed mandatory "time out" for me as well. When he sleeps and I'm at home, I don't touch the computer, or my phone. I crawl into my bed and read a book. That's "me" time. I stopped caring if the dishes were done, or if lunch was already made. I try to get those things done before he naps, and I let J help in his own way, so we do it together. But baby naps = me time now. And it makes a huge difference. A work day? We wake up at 6am, J has his milk while I eat breakfast...on my lap. I shower while my husband watches him, then we get dressed and we're out the door by 7:15am. I drop off J at my grandma's at about 8am hang for a bit, then am off to the office, where I stay until 3 or 4pm. I do my groceries during lunch or on my way home, or if I don't have groceries to do I go to the gym. I pick up J around 4:30 or earlier and drive downtown. I cook dinner and we eat at 6pm. By 6:30 we go outside for a walk. Baby bath and bed at 7:15pm. If its a gym day, I go to the gym at 7:30-8:30pm (I have one in my building which helps with zero transit time). Come upstairs, do some work for work, while having a shake. Blog for an hour or so. Bed by 11 or 12. Thanks so much Ana! I absolutely love her 'me-time' during nap-time. I think I need to adopt this strategy. Ben wakes up and I'm scrubbing floors, frantic and annoyed that he only slept for 20 minutes. Sigh. I like this series! Going to check out her blog right now! Thank you so much for having me Adriane, and for your very flattering introduction. I adore your blog too and love reading it daily. No kidding that she's a supermom! That description of a typical day makes this stay-at-home mom feel like quite the lazy bum. I look forward to reading Ana's blog! Right??? I strive to have half the energy she does!